Animals really are quite smart. I swear they have a sixth sense and can pick up on changes that you cant physically see. The cats have always been good at responding to my emotions, they can always instinctively tell when I'm sad or lonely and they make sure they come and sit with me. Its gone to a whole other level now that I'm pregnant. 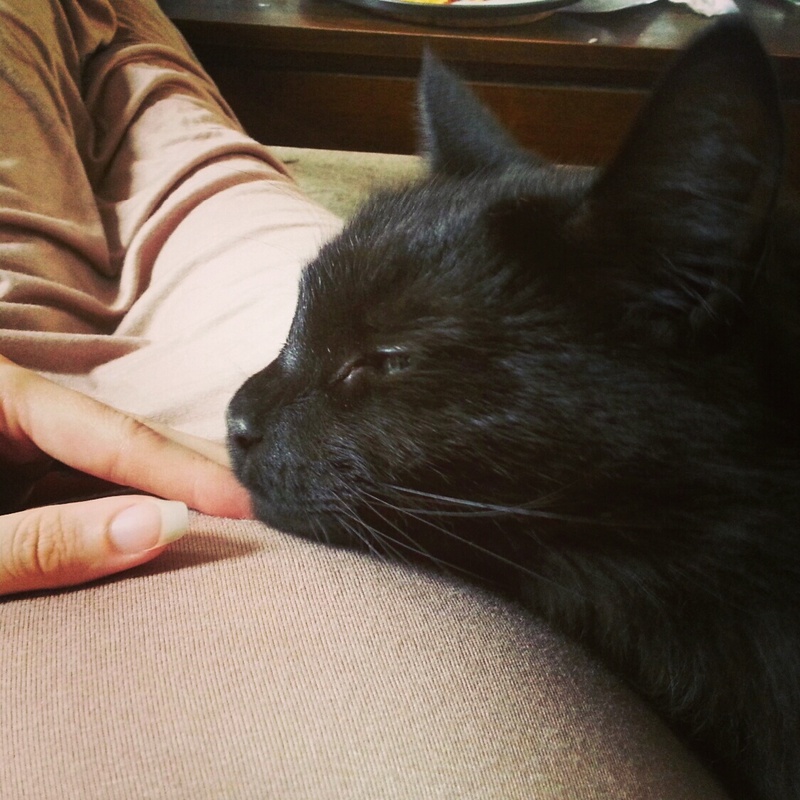 Before I even knew I was pregnant I went to visit my friend and her cat was acting very strange around me. He's normally very independent and will come up for a scratch but that's about it. That day he was all over me. He was coming and laying on my lap with his arm over my belly and going to sleep. When he wanted to walk to the other side of the couch he would jump down walk around my legs then back up on the couch and continue walking across it, like he was too scared to jump over my belly. Both me and my friend noticed how weird he was acting, but neither of us tweaked that I could be pregnant. A little less than a week later I got a positive pregnancy test and his behaviour suddenly made sense. I swear he knew. My own cats have also changed their behaviour. They follow me around a lot more. If I take a nap they have to come and sleep on the bed with me. Shelby is a lot more attached to the baby though. Since the very first few weeks she has snuggled onto my belly at night. I remember the night she sat on my belly and got kicked for the first time. It was hilarious. One minute she was happily sitting there asleep the next her eyes pop open in shock and she had the weirdest expression on her face (kind of like wtf was that and where did it come from??). Then the second kick and she was gone. 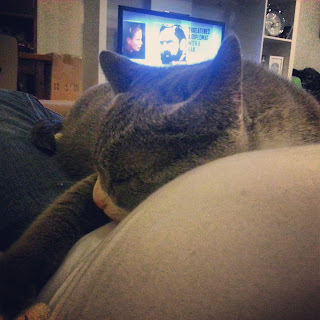 She has gotten used to it though because now she sits on my belly and when she gets kicked she just purrs and snuggles in closer and somehow always manages to put the baby to sleep. Its kind of cute that they are little buddies already. The last few weeks the cats have got a bit more frantic with their behaviour. I think everyday they are on edge thinking when the hell is this thing going to come out. I mean there's a big difference between a nine week cat pregnancy and a nine month human one so they probably think I've been pregnant for years now. Their latest thing is that they wont let me go to the toilet by myself. They take turns watching me each time I go. I have no idea how they work out who's turn it is each time - maybe its whichever one is closest to the toilet or they do a tag your it kind of thing? Some days they are so edgy I get all three of them in there with me. Jasper is usually up on top of the toilet behind me, Shelby stands up against my leg and Max is usually sitting in front of me looking confused. I swear its enough to give a girl a complex. Every now and then Max or Shelby will try and check the bowl after I get up, just to make sure she's not in there. I don't know what they think they're going to do if she does actually fall out into the toilet? Jump in after her? I guess its nice that they care though. Poor little things must be so confused about what's happening. Apparently they are meant to be able to sense when birth is imminent. So, the day all three of them start following me from room to room throughout the day I will be the one on edge. They do love a pregnant person, I've heard! Especially their own pregnant person. Then they get the joy of another human kitten to cuddle and care for. What a great read, can't wait to find out what happens next!